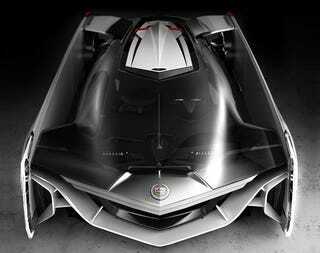 Its name is the Cadillac Estill, a futuristic super car concept that, according to Jirec, "links to the history of the Cadillac brand but is not retro." The desired result was to create a concept that maintains clues from the history of the Cadillac brand and introduces a futuristic and fresh vision. The history clues were a fuselage suspended between two long body sides – a good example is the 1970 Cadillac Eldorado. Taking this pure form study, stripping down from all details, and taking it as a building theme for the whole concept, those were the main inspiration for the development of this concept. The interior layout is built around the driver experience. The passenger seat is pushed slightly back so the driver can reach the feeling of being in a true race car, inspired by the Cadillac Le Mans heritage. Ondrej Jirec is a Czech Transportation Design student at the Art Center College of Design, in Pasadena, California, who received a Mr. Otis and Mrs. Bettina Chandler full endowed scholarship from 2008 to 2013. He has worked at General Motors and Honda R&D in California, Aston Martin in the UK, and Stile Bertone in Torino, Italy. You can follow his site here.